To be in the life sciences industry, it is important to never stop seeking out new ideas and thinking imaginatively. 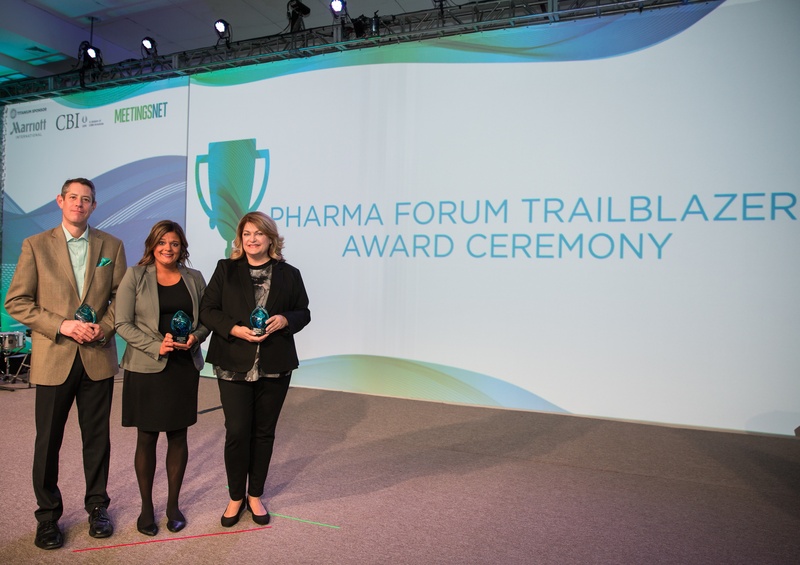 That is why this past March, at the 14th Annual Pharma Forum 2018, three recipients were honored during the premier Trailblazer Award Ceremony. These recipients were nominated by friends, family, and colleagues in recognition of their innovation and vision. The Experience Innovation Trailblazer Award was presented to Robin Macario of Genentech for consistently bringing passion to her meetings and happiness to her partners and colleagues. The Collaboration Trailblazer Award recognized Brian McArdle of Allergan for his dedication to building and maintaining key relationships in his work. Finally, the Passionate Trailblazer Award honored Donna Grissom of Ashfield Meetings & Events for bringing passion to her work by leading successful teams and conducting engaging meetings. Why did you start working in the life sciences industry? Robin Macario: I started at Genentech in 1984. Brian McArdle: By accident. I started as an Admin with a hotel marketing company, and was eventually moved into sales. When I realized I liked the client interaction on a meeting but not the selling part, I began a job search. Eventually, I joined WorldTravel Meetings and Incentives as a Sourcing Manager supporting Warner-Lambert, which became Pfizer. Pure coincidence. Donna Grissom: I honestly did not seek a career in the life sciences industry. I began my career at a conference center, where I managed social and corporate events. It quickly became clear to me that I favored corporate events over social. My previous manager had been at Ashfield Meetings & Events (at that time Universal WorldEvents) and reached out to see if I would be interested in a position. I took a leap of faith and started my career at Ashfield Meetings & Events, which I can easily say was the best decision for my professional career. I have grown more personally and professionally than I ever expected and foresee many more year of growing with Ashfield ahead of me. Can you share one piece of advice for those who are new to the industry? Robin: It’s very dynamic, and you have to be flexible and adjust quickly to changes. Brian: I can share a lot, but remember that it is a two-way street. You need good hotel availability as much as a hotel needs your business. It’s a partnership. And that the most underrated and most effective piece of technology is the phone; use it. Donna: Don’t get so caught up in being successful that you don’t take time for yourself. Maintaining a healthy work-life balance is essential in this industry. I still often have to remind myself that as I’m lying on my death bed, I won’t regret not sending that last email at 6:30 PM, but I will regret the dinners I miss with my husband and family. Can you share one piece of advice for those who are not new to the industry? Robin: Hang on – it’s a wild ride. Brian: You could use the same answer as above, but to work in cooperation and collaboration, not competition with your partners. And they are partners, not vendors; vendors sell beer at Yankee Stadium. Donna: Think like there is no box. Don’t get trapped by existing standards and processes. I often tell my team “just because we’ve always done it that way, it doesn’t mean it’s the best way.” Don’t be afraid to challenge the existing way, never stop learning and growing, and keep up with the innovative technology because it’s not going away. Robin: Retiring and travelling for fun. Brian: Really not sure; 10 years closer to retirement, but hopefully overseeing a sourcing and planning team that is universally respected and does things the right way. Donna: I see myself as a mother and a successful senior account manager at Ashfield, continuing to grow my team, relationships with my clients, and becoming a better me. Robin: Royal Blue – the name says it all! Donna: Sandstone – I feel it’s important to be unrestricted like sand, but it’s also important to stay strong and stay true to yourself throughout life similar to a stone. Additionally, I love being outdoors and nature, so a sandstone fits well. Do you know someone who exemplifies innovation, collaboration or passion? Nominate them (or yourself!) for the 2019 awards today! © 2016 UBM Americas, a part of UBM plc. All rights reserved. Reproduction in whole or in part is prohibited. Please send any technical comments or questions to our webmaster.